Areas of CONSIDERABLE danger exist on many slopes in the mid and upper elevations with a MODERATE danger down low. Some avalanches may be triggered at a distance or from below. Long running natural avalanches may be possible in the high alpine wind affected terrain. Avoid avalanche runout zones (especially on Timpanogos and Box Elder). Avoid being on or beneath the heavily corniced ridgelines. Along a cool west-northwest flow, a trace to 2" fell overnight, pushing storm totals since Saturday night to 34' of snow and 3.65" of water. Moderate to strong winds, mostly along ridgetops but occasionally getting into mid elevation terrain, have also added stress to the snowpack. These are significant loading events. West-northwest winds are generally 15mph with gusts to 25. The highest, most exposed anemometers are averaging 35-40mph with gusts near 60. Temps are in the low single digits on either side of zero. Snow depths are 80-90". Skiing and riding conditions are out of this world. People lives are changed by conditions like these. 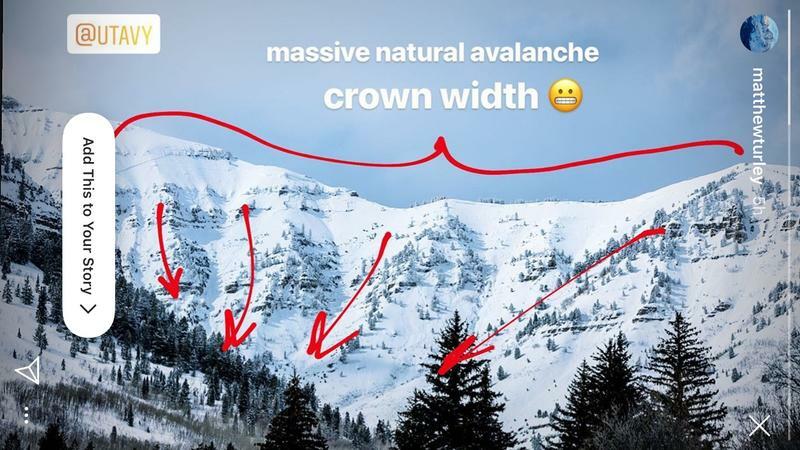 A natural avalanche likely occurred yesterday in upper Primrose Cirque above Aspen Grove on Timpanogos. It was large and destructive and thousands of feet wide. Thanks Matt Turley for the photo below. 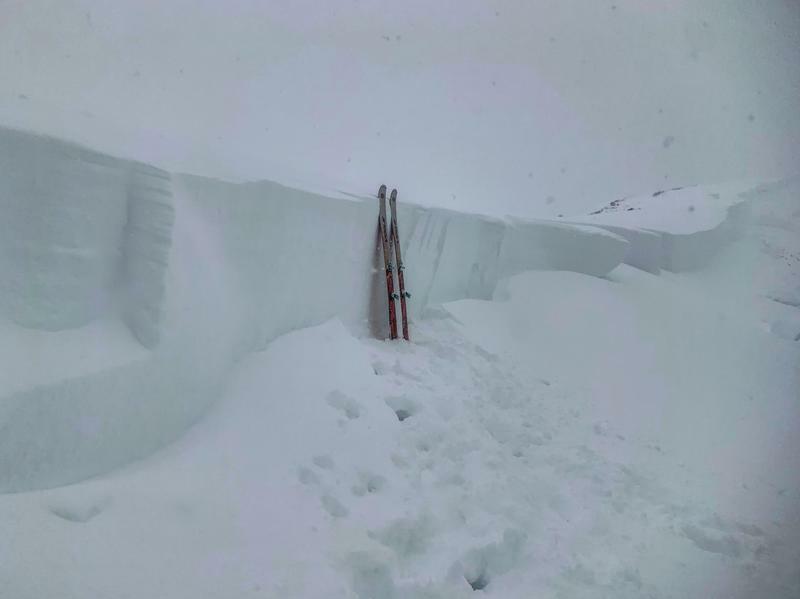 There was also a very large natural 3-8' deep on the 4th on the southern end of Timp at 8500-9000' elevation (est). Weak surface snow and patches of surface hoar buried Saturday night. 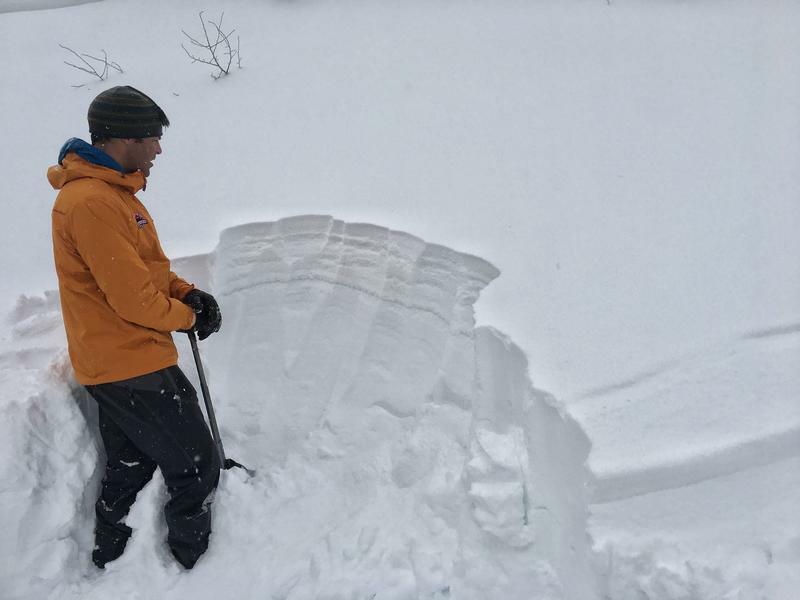 This layering has likely been the culprit in at least four avalanches in the Cottonwoods. These have been 1-3' deep on wind drifted north to northeast facing slopes with elevations from 8800' to 10,200'. Some of these have run naturally, some of been triggered at a distance. 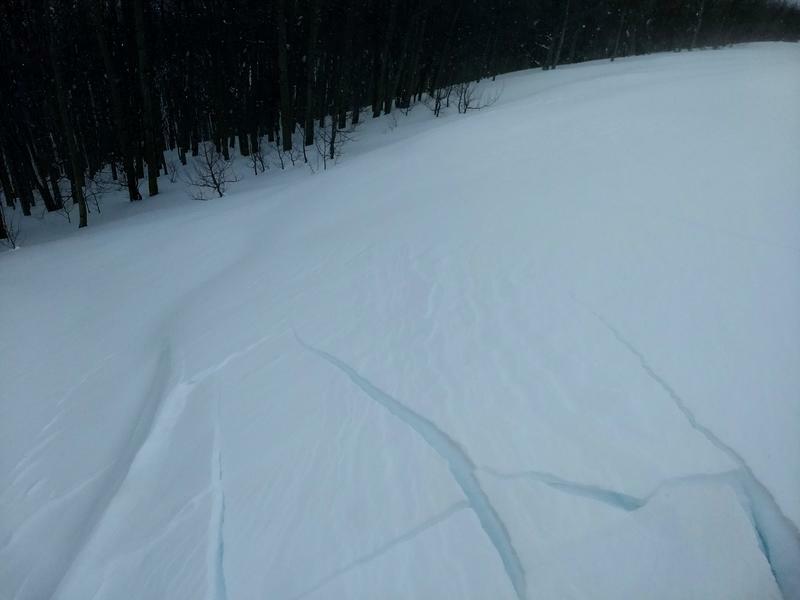 Cracking/collapsing are key indicators here; snow pit tests should also be reliable indicators for intended terrain - look for the 'thin grey line' a couple feet down in the snowpack (pic below). Caution should be observed as these may be triggered on approach or from below.